Rocking Horse Silhouette Address Plaque - - rocking horse shape address sign custom made in the USA. Wall mount address sign is personalized with the house number you supply and color you select. 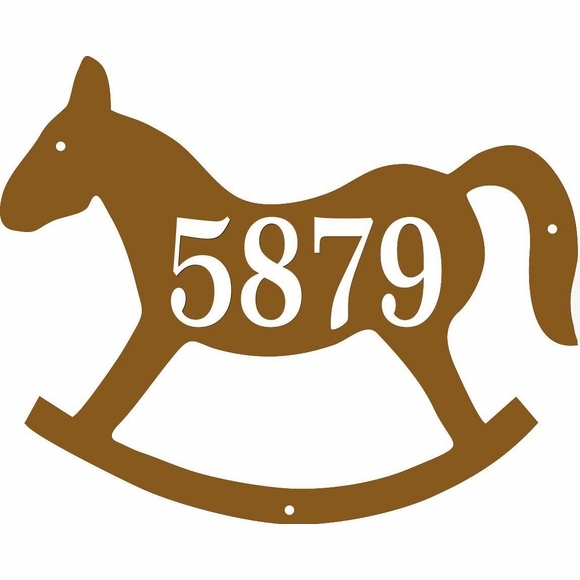 Whimsical address plaque is a fun way to identify yourself as an equestrian, horse owner, jockey, or horse trainer, etc. Two slightly different rocking horse shapes. The styles are arbitrarily named Brownie and Greenie. Brownie style holds a house number with up to four (4) 2.5" characters. Greenie style holds a house number with up to three (3) 2.5" characters. Made from sturdy and UV-stabilized non-rusting laminated acrylic with engraved personalization. Characters are permanently engraved into the silhouette during the production process, not painted or printed on. Comes with three 3/16" diameter fastener holes and stainless steel mounting screws. Dimensions (approximate): 11.5"W x 9"H x 1/8". Other rocking horse silhouette sizes available: can scale smaller or larger up to 36" wide. Please contact us with your requirements.